Exklusiv für die Diana+ designed sind diesen beiden Linsen. Never have two absolutely devastating all-plastic medium format lenses been engineered to work together in perfect harmony. First off, the Wide Lens provides a focal length roughly equivalent to a 34mm lens on a standard 35mm camera. Which is very close to the perspective of our very own Minitar 1 lens â?' the shining jewel of every Lomo LC-A+ camera. The overall effect is a pleasing wider-than-normal view with that same classic Diana+ vignetting, selective focus, and dazzling color saturation that all we all adore. Next, the included Close-Up adapter slides onto your 55mm Lens and allows you to shoot everything at 15cm (about 6 inches) away. Images are dripping with color and shallow depth of field: meaning that a tiny bit of foreground is in focus against a soft and creamy blurred background. Includes accessory viewfinder, viewfinder mount, and lens caps. 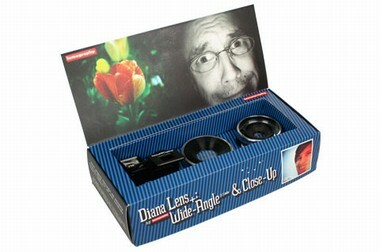 NOTE: The Close-Up Lens requires the 55mm Lens to work, and is not sold separately. Hast Du schon mal was bei uns gekauft? Hast Du ein originelles Zimmer eingerichtet oder sonst einfach ein spezielles Zimmer? Dann sende uns ein Bild deines Zimmers! Alternativ kannst Du auch Bilder von Dir oder von jemandem den Du kennst einsenden. Bedingung: Es muss einfach mindestens ein Klang und Kleid Produkt auf den Bildern erkennbar sein :) Du kriegst für jedes hinaufgeladene Bild 100 Coins gutgeschrieben! :) Wenn genug Bilder zusammen kommen, prämieren wir jeden Monat das beste Foto mit einem Einkaufsgutschein von 100.- CHF!